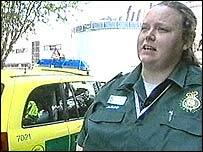 BBC NEWS | Health | What does a 'super-paramedic' do? What does a 'super-paramedic' do? Ambulance services are set to change with proposals where 999 callers may be dealt with over the phone or at home. Emma Williams is an emergency care practitioner working in Hounslow in west London. She is one of a new breed of "super-paramedics" who can treat patients in their homes, prescribing a range of drugs and liaising with GPs, physiotherapists and social services. Emma says that, in many cases, she can do more for patients than a traditional ambulance crew. "If an ambulance goes to an elderly person who's fallen, but not necessarily sustained an injury, and that person refuses to goes to hospital, there's not much more they can do." In contrast, her diagnostic skills and referral abilities would come in handy. "In one case, I went to an elderly lady who had fallen. "With my extra training, I could see that she had a urinary tract infection which had led to her confusion, and therefore her fall. "I could also give her a course of antibiotics, and refer her back to her GP. I could also have referred her to social services if she had needed it." She added: "Before, I would have had to take her to A&E so that they could enter the system. "Now we can skip the 'middle-man'." She said she was called out to patients with a wide range of conditions, including road accidents and heart attacks. In those more serious cases, Emma would be called on as an "extra pair of hands". Her vehicle is fitted out with all the equipment a traditional ambulance would have, except for stretchers for moving people. Emma, who works alone, added: "We don't go out to people who are on the floor because we can't lift them, and we don't go to situations where we know there's violence or aggression." She said she didn't work in isolation from the ambulance service - in fact she was part of the same team. Calls which need attending are passed to either the ECPs or a traditional ambulance crew. And she said patient's views were the deciding factor. "If they do still want to see a doctor, we respect their wishes. "But most of the time, when we sit down and talk to someone, and give them a full assessment, people are happy with that."